A roller board for play and therapy! 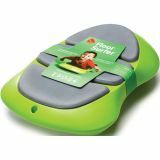 Developed in partnership with children's physiotherapists to ensure safe use by any child irrespective of motor skills level. Features quality, non-marring wheels with double ball bearings. Supports up to 220 lbs. 22"L x 14 1⁄2"W x 5 1⁄2"H. Ages 2 and up.